It has been a while since I posted anything on the blog, I can’t believe it! Life does sometimes get in the way of wonderful hobbies. Harsh winter weather does not help either. I got so busy, that at first I just kept postponing writing, and when I finally got time to breathe, I realized that I had missed out so much of the fun. 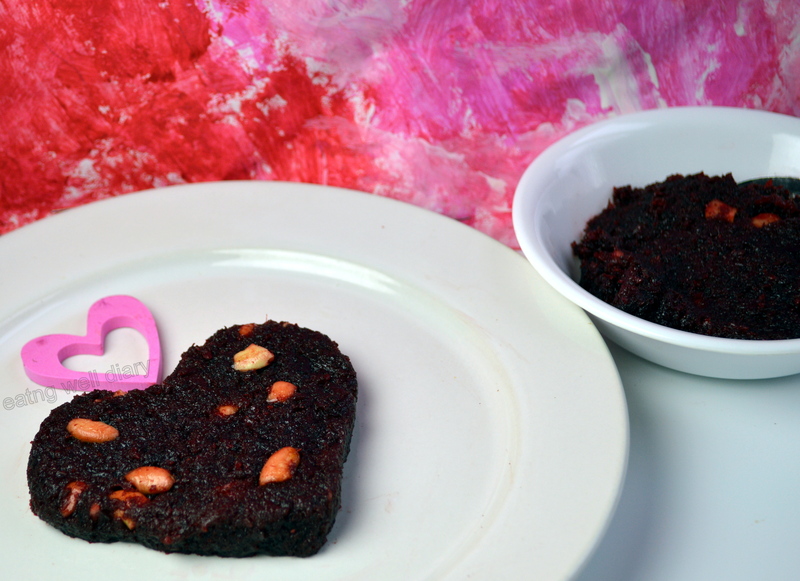 So here I am, making use of Valentine’s Day to inspire myself into making this delectable pink ‘heart’ dessert with beet and carrots. 1. I am regularly making almond milk at home and end up with a lot of almond fiber or almond meal. I just stick it in the freezer every time I make it and always have packets falling off when the freezer door is opened. So I have to invent ways of using it and here’s my first idea. 2. I recently got myself a good ceramic coated non-stick pan from Bed Bath and Beyond. This is the first dish I tried in it and it came out so well, I have made it three times already. I’m taking this to Fiesta Friday #55 at the Novice Gardener’s blog, co-hosted by Sue of Birger Bird and Suzanne of A Pug In The Kitchen. Also submitting this to the Virtual Vegan Potluck #29 hosted by Poppy and Angela. 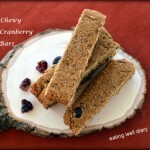 This will be my first submission at Allergy Free Wednesdays at Nancy’s Real Food, Allergy Free blog. 1. 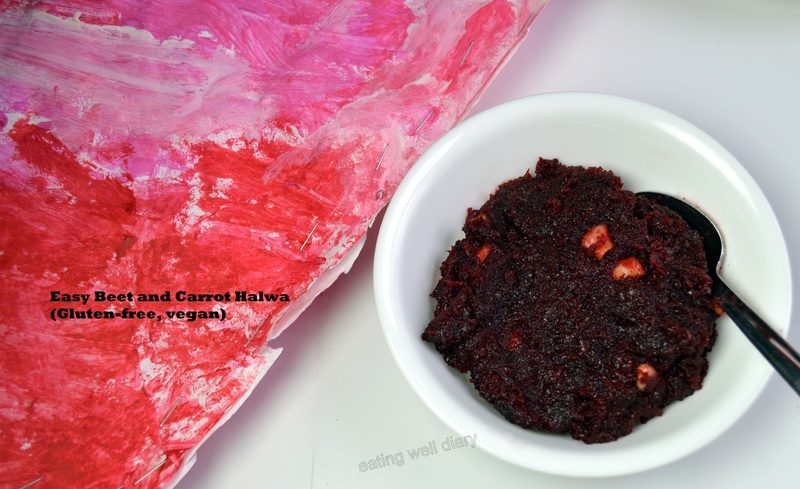 Cook the grated beets and carrot in almond milk. I used a pressure cooker (two whistles) to do this really fast. 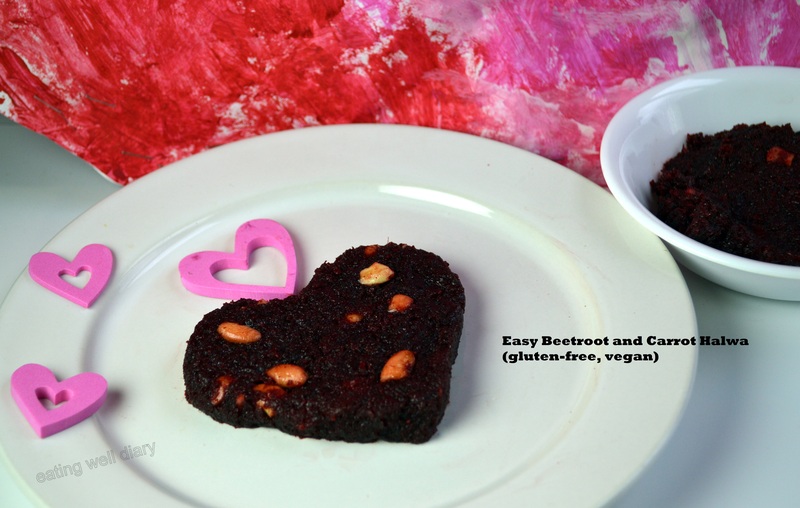 This removes the ‘earthy’ taste from beets in the fudge. 2. Heat your non-stick pan, toast cashews in a tsp. of oil till they brown and set them aside in a bowl. 3. Add the beet mixture, sugar, stir. Let it boil and reduce a little. Next, add almond meal, cardamom, coconut oil and stir with a silicone spatula on medium heat. 4. When the mixture leaves the sides, turn off heat, add cashews and transfer to a container. Allow to cool completely before storage. Yes, Vidya. My favorite too! Thank you so much. Have a great V-day! Waw! They look lovely so I had to make them! What an amazing and healthy shRe Apsara. 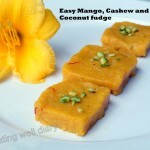 I will be checking out the vegan blog linking too. I still Have to work with beets in dessert. Yes, Sonal. Super easy too. I love the VVLP blog hop, lots of fun. Apsara gowri mami here.what is almond meal.i think it is not available here in india,right?the recipe and presentation are wow!!! Thank you, mami. Almond meal is just the fibre left out from making almond milk. Instead you can use almonds ground in a mixie, it is the same thing. Or, you could use almond paste made from soaked almonds. That way, there is no need to add milk in the halwa. Such a lovely healthy treat thank you so much for sharing this with us Apsara! thank you Suzanne. Thanks for co-hosting too at FF, it sure is a huge party to host! thank you, dear. Hope you had a wonderful weekend. You find new ways to treat regular substances at hand! Kudos to you! Looks awesome as always, Apsara.